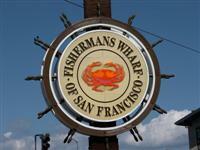 Some people love the bustle of Fisherman's Wharf, while others make a conscious effort to steer well clear of it. For better or worse it is massively popular, attracting more visitors than any other city sight, with Pier 39 the commercial tourist epicentre. The Wharf was once a fishing port with dozens of boats anchored here. Pier 45 is still used by fishermen in the early morning hours, and fish and seafood can be bought from the Fish Alley Market. There are shops galore, fast food stands and overpriced bay-view restaurants as well as bars, markets, street performers, and an endless variety of activities for the whole family. It is also the gateway for several top attractions: trips to Alcatraz and other bay cruises leave from here; numerous museums include the Historic Ships Pier; and the USS Pampanito submarine that can be boarded from Pier 45. The entertaining colony of sea lions that reside on the floating docks at Pier 39 are one of the best attractions on the quay. The quirky Musée Mécanique is located nearby Pier 45, and houses the world's largest collection of vintage coin-operated mechanical wonders. Transport: Bus 15, 30, 32, 42 or 82X goes to the wharf, or the Powell-Mason cable car line to the last stop.